As a healthcare consumer, you have choices when it comes to selecting your mode of treatment. It can be confusing to sift through the available options, especially when you just want to feel better fast. If you suffer from depression, anxiety, insomnia, or pain, you may have heard about a treatment option called Cranial Electrotherapy Stimulation, or CES. CES has been cleared by the US Food and Drug Administration (FDA) and is available by prescription in the United States. As with most products, however, there is a wide range of pricing among CES devices – and this is one situation where you do not want to skimp on quality in favor of a bargain. Alpha-Stim® is a CES device that is trusted worldwide by medical professionals for its fast, safe, and effective treatment of depression, anxiety, insomnia, and all types of pain. Dr. Daniel L. Kirsch invented Alpha-Stim in 1981, and the device has been changing lives ever since. But what makes Alpha-Stim special? 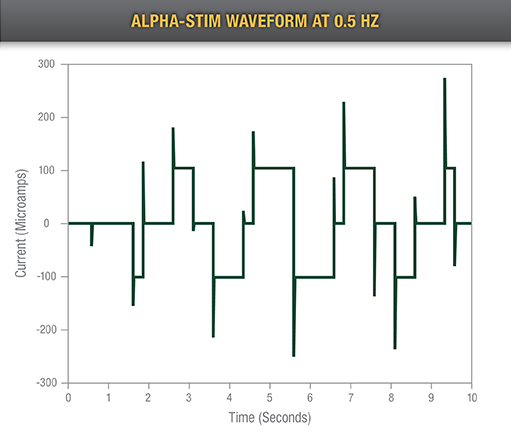 What makes Alpha-Stim superior to other CES devices on the market is its patented waveform. 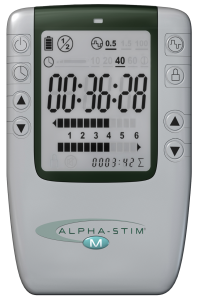 Alpha-Stim generates a unique configuration of microcurrent unavailable in any other CES device. For anxiety, depression, and insomnia, this waveform is transmitted to the brain via patented Earlip Electrodes. With the Alpha-Stim M, two handheld probes deliver the microcurrent directly to the site of pain. Because of these patents, Alpha-Stim is in a class of its own. The Alpha-Stim waveform amplifies certain neurological activities while decreasing others, in a process called neuromodulation. The beneficial results are remarkable enough to be measurable on an EEG, and patients can experience marked relief after just one treatment. QEEG changes in 30 subjects treated with 20 minutes of CES. There is an increase in alpha activity with a simultaneous decrease in beta and delta. Patents and design are important, but that is not the only advantage to Alpha-Stim. Over 100 independent clinical research studies and published reports support the effectiveness of Alpha-Stim. Nine out of ten users experience significant relief when treating their depression, anxiety, insomnia, and pain. Further, Alpha-Stim is honored to be trusted and relied upon by the United States military – it is available at more than half of the nation’s VA hospitals and has become a first line of treatment for the men and women who serve our country. Additionally, an MD Anderson Cancer Center study published in the Journal of Pain and Symptom Management provided even more solid evidence that Alpha-Stim does its job, and does it well. These studies have been conducted on Alpha-Stim specifically; other CES devices do not make the grade. Other CES companies may cite research in their favor – but these studies are outdated and typically decades old. 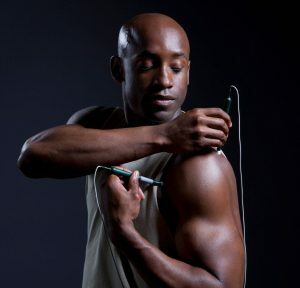 Studies that support the effectiveness of Alpha-Stim continue to be released regularly, and award-winning publications are touting the benefits as well. Still, some people may balk at the cost of an Alpha-Stim. The AID device (for anxiety, insomnia, and depression) retails for $795 and the Alpha-Stim M (for all of the previous indications, as well as pain) for $1,195. While this may seem a steep upfront cost, patients receive immense value for their money. To begin, Alpha-Stim comes with a 5-year warranty – as well as an option to return the device within 30 days. A dedicated customer service team can provide clinical and technical support to help users obtain maximum benefit from their devices, no matter how long they have had them. On top of that, the effectiveness of Alpha-Stim makes it a cost-effective option when compared to common prescription medications. Over the course of five years, Alpha-Stim users can save thousands of dollars compared with drugs and other treatment methods. Other CES devices may be cheaper, but do not deliver the same results. And finances aren’t the only cost to consider. Because Alpha-Stim is not a drug, there is no risk of addiction or lasting side effects. Treatments with Alpha-Stim allow you to feel better, without the heavy toll of the side effects and potential withdrawal symptoms that accompany prescription medications. When it comes to your health and wellbeing, you deserve the best and most effective treatment. If you are considering CES to treat your depression, insomnia, anxiety, or pain, Alpha-Stim is not only the original, but the top of the line. To feel your best, choose the best. Choose Alpha-Stim.